I've been frustrated for a long time with the reliability of official estimates of employment in St. Louis. The Bureau of Labor Statistics (BLS) produces these every month, but they usually face such large revisions that they're pretty useless. Rather than keep complaining, I decided that I would do something about it. Specifically, my institute, the ISEE at Lindenwood University, will begin producing its own data series that makes better use of the data that are available. The first release of this data was today, and the results were pretty much what I predicted in my very first blog post back in June. 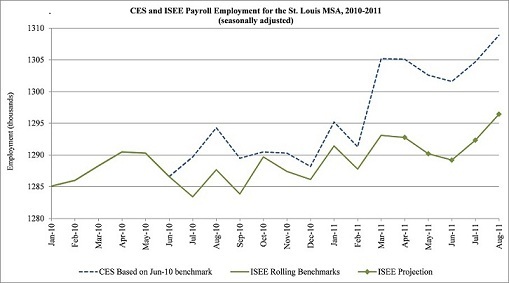 The official numbers have been overestimating St. Louis employment for over a year and the ISEE's estimates place the August-to-August increase in jobs at 8,800. The official estimate is that job growth over the period was 14,400. There is a web site dedicated to the data. Here's a chart of the employment estimates for January 2010 through August 2011. The green line is the new ISEE data and the dashed blue line is the official data from the BLS.